After the NASCAR Camping World Truck Series battle changed dramatically with a wreck involving the two series leaders, Timothy Peters held off John Hunter Nemechek to win Friday night’s Lucas Oil 150 at Phoenix International Raceway. Peters beat Nemechek to the checkered flag by .309 seconds to record his first victory at the one-mile speedway, his second of the season and the 10th of his career. However, the real drama occurred 30 laps before Peters crossed the finish line in the 150-lap event. The dominant trucks of series leader Erik Jones and two-time defending champion Matt Crafton fell out of contention, wrecking during an intense battle for the lead. As Crafton and Jones raced side-by-side for the lead after a restart on Lap 120, Crafton’s Toyota slipped underneath Jones’ Tundra in Turn 4, Crafton drove his truck deep and hard loosing the backend, getting it extremely crossed up, and pinched Jones against the outside wall. 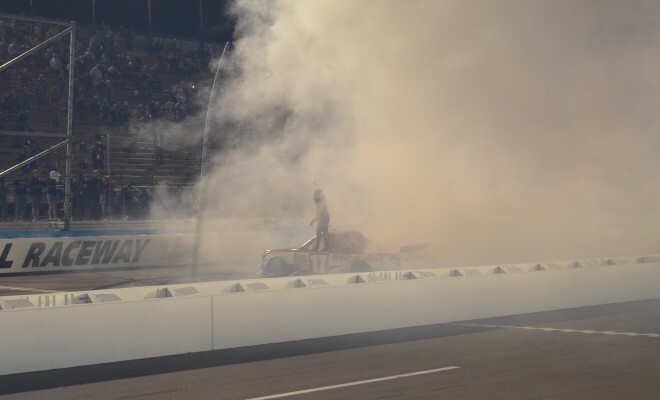 In trying to get control of his high speed missile, Crafton shot to the left and knocked ThorSport Racing teammate Johnny Sauter’s Toyota into the inside wall, critically damaging both vehicles. Despite damage to the rear of his truck, Jones salvaged a lead-lap ninth-place finish and maintained a 19-point lead in the series standings over second-place Tyler Reddick, who finished fifth on Friday night. Crafton wasn’t so fortunate, however. His 23rd-place finish left him 32 points behind Jones, who can end Crafton’s title run with a finish of 27th or better next Friday at Homestead-Miami Speedway. Jones can clinch his first championship outright with a finish of 15th or better in the season finale. Peters had to dodge a Lap 6 wreck involving Brandon Jones, William Byron and Cole Custer before he could think about winning the race. “When I saw it happen, and (the wrecking trucks) coming back across the race track, I can’t tell you what I was thinking, but it was ‘Here we go again,’” said Peters, who posted his seventh straight top-six finish in a stretch that includes two wins. “The last two years, we’ve had great trucks (at Phoenix), but we’ve been in the right place at the wrong time. Timothy Peters’ victory gave Toyota its eighth manufacturers’ championship in the Truck Series!